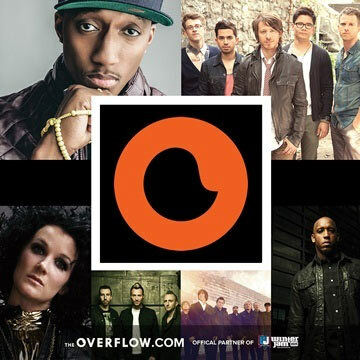 TheOverflow.com - soon to be the world's first Unlimited Christian music subscription streaming service, is excited to be partnering with Winter Jam - the World's Largest First Quarter Concert Tour, and YouVersion - the World's Largest Bible App to announce the May 1 release of 'The Overflow Devo: Winter Jam Edition'. The Overflow Devo Winter Jam edition is an extension of the popular, free written and video devotional plan where Christian artists break down their songs in biblical terms. The Winter Jam Edition will feature Devos from Lecrae, Tenth Avenue North, The Newsboys, Plumb, TFK, NewSong, Derek Minor, Colton Dixon, Everfound, Love & The Outcome, and Evangelist Nick Hall from Pulse, representing Reset Movement. To complement the devotional, users can download an exclusive, free sampler of songs from Lecrae, Tenth Avenue North, Plumb, TFK, NewSong and Derek Minor. "We're excited to partner with The Overflow on their devotional plans with YouVersion. We believe this initiative helps deepen the Winter Jam experience by bringing people closer to Christ - the true passion of Winter Jam" says Troy Van Liere, Winter Jam Tour Producer. Aimed at bringing the Gospel to more students and young adults in the United States than ever before, Pulse Movement's Nick Hall says "The Overflow Devo on YouVersion is a great way to take next steps in your faith journey with Jesus, and get to know God's heart for the world". Introduced in 2008 and with over 138 million downloads, YouVersion is the #1 rated Bible app and a completely free resource, offering hundreds of translations and more than 800 Bible Plans. "Our YouVersion community has really enjoyed devotionals from The Overflow, so we're excited to be able to add this new collection of plans. Combining text and video has proven to be a popular way for people to engage with God's Word daily," said Bobby Gruenewald, Pastor, Innovation Leader at LifeChurch.tv, which started the Bible App. Since creating Winter Jam in 1995, NewSong hosts and continues to oversee the exponential growth of Christian music's largest annual tour. Winter Jam has ranked as the World's Most Attended Tour on Pollstar's 1st Quarter Tour Rankings for 4 consecutive years. Through the years the Winter Jam Tour Spectacular has featured such defining artists as TobyMac, Skillet, Steven Curtis Chapman, Francesca Battistelli, Third Day, Jeremy Camp, Kari Jobe and David Crowder Band, among many others, and provides a powerful platform for the Gospel message across the country. Learn more at JamTour.com. YouVersion and the Bible App were created by a team at LifeChurch.tv in Edmond, Oklahoma, to help increase access and engagement with the Bible. Featuring over 800 versions for free in more than 500 languages, YouVersion was created to help people with busy, on-the-go lifestyles read the Bible at any time and in any place. The Bible app can be downloaded for free from all major app stores and at bible.com/app.